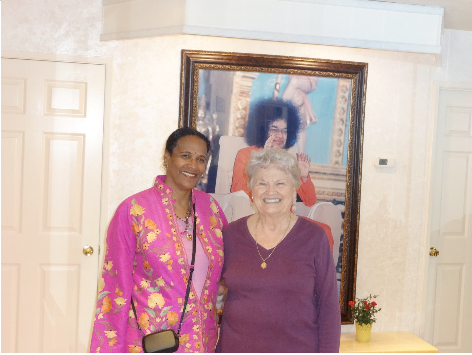 We arrived at the Tustin Sathya Sai Baba bookstore early. It was very exciting to see Sai Baba's name prominently and publicly displayed. Uma a bookstore volunteer arrived early and welcomed us. The bookstore was a portal to another world. Photos of Lord Sai adorned the walls. I was thrilled when I spotted my book, Sai Rapture, The Ecstatic Journey of a Modern Day Gopi seated on these hallowed shelves. David and I removed our shoes and tiptoed softly, reverently into the inner sanctum. A huge portrait of beloved Sai Avatar graced the altar. 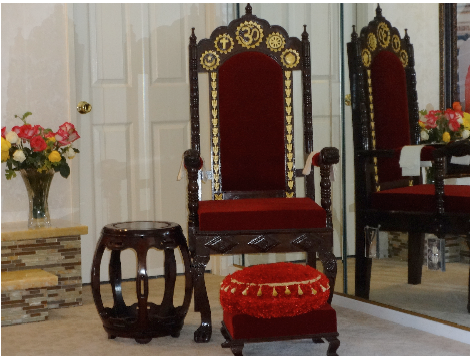 A majestic red velvet chair The Lord of The Universe once sat upon crowned the room. We knelt at Sai's Lotus feet taking padanamaskar. 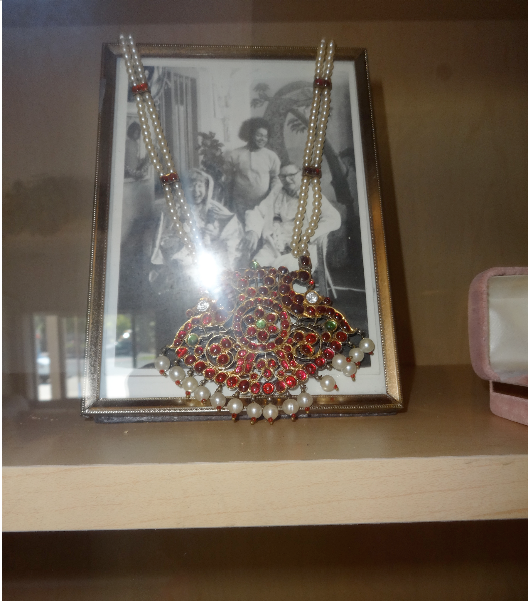 Uma then ushered us into another sanctuary – Swami's innermost room. This cloister was softly lit with Sai's loving Presence. 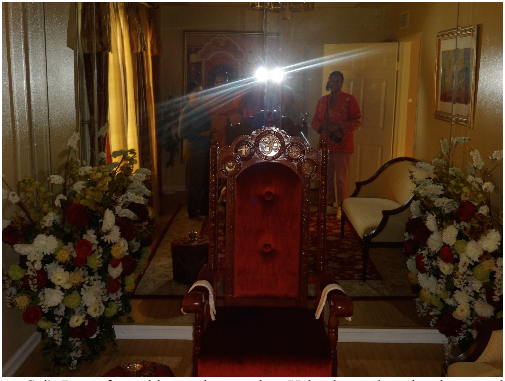 Again we bowed down at the footstool of another glorious throne once occupied by Swami. Uma led us out locking the door to Swami's room. She invited us to meditate while we waited for Berniece Mead. Berniece Mead burst into the bookstore exuding tremendous energy and vitality. She was a storehouse and wealth of Baba stories and information. Quickly she pointed out the founders of the bookstore Elsie and Walter Cowan's photos high up on the wall. She knew Elsie well but Walter had already passed away when she came into the Sai flock. Berniece Mead is the USA, National Education Coordinator for Sai Spiritual Education Program. She grew up on a farm with 11 siblings. Life was hard on the farm, juggling school work with tough farm labor. Despite this she and her siblings managed to attain college degrees and Berniece became a school teacher. She taught grades k- 8 grade for many years. Continuing: There was a glass display case on the left side of the meditation room. 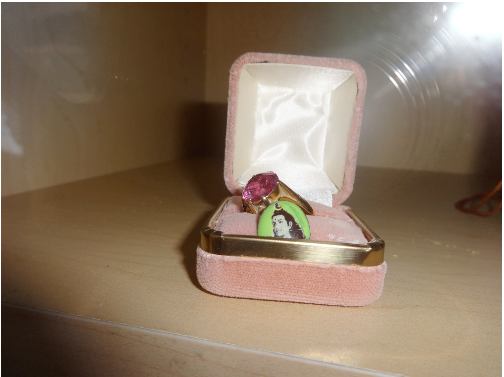 Berniece pointed out the gold rings with unusual red stones Swami had materialized for Walter and Elsie Cowan's re-marriage ceremony. 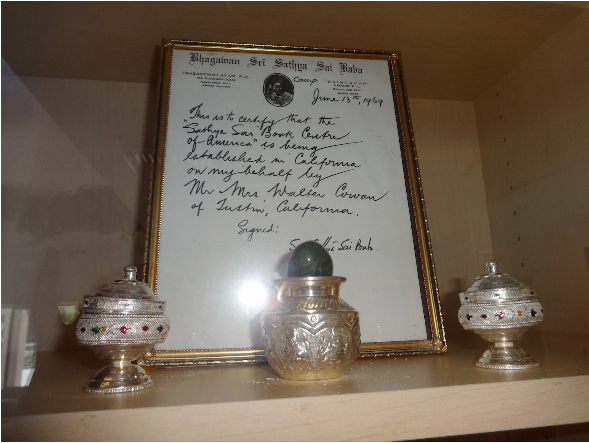 She also showed us an enormous multi-stoned necklace created by Baba for the ceremony and the letter certified by Sai Baba for the establishment of the bookstore along with a beautiful lingam. 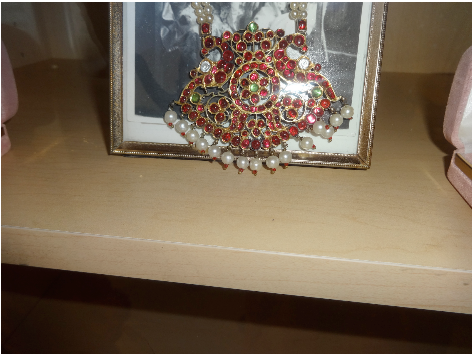 In the lower part of the case was the sari and white shirt given for the remarriage. "Ron helped in the building of the new Book Center which was finished in '83. Up until then it had been in several places and started in one of Elsie's condos. I went to Prashanti in '83 and Swami called me in and asked how the Book Store was doing. I told him they were on the final finishing and that it looked beautiful. That's when he said, "They lack this and he started naming what they were doing by pointing to his fingers on the left hand by using his right hand, that's what Ron would do when people asked him how the book store was doing. He was imitating Ron's actions. 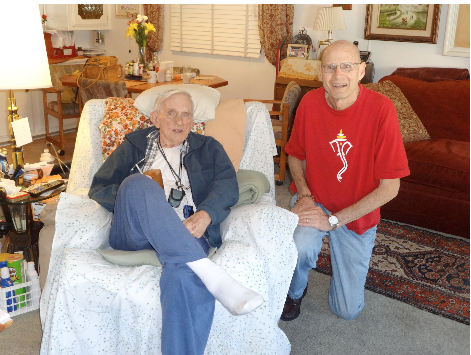 I didn't know it at the time, but Ron knew exactly what he was doing when I told him the story." the, extraordinary, insightful book written by Berniece Mead, Letters from J: The Expanded Life of a Coma Patient. 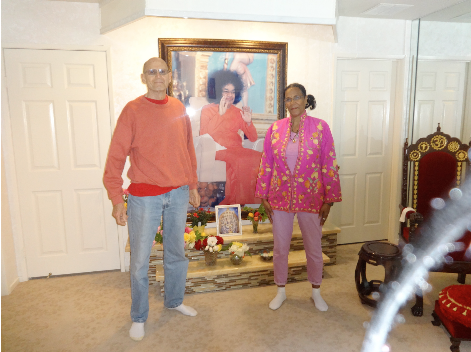 The book is available on Amazon and at the Sathya Sai Baba Tustin Bookstore. 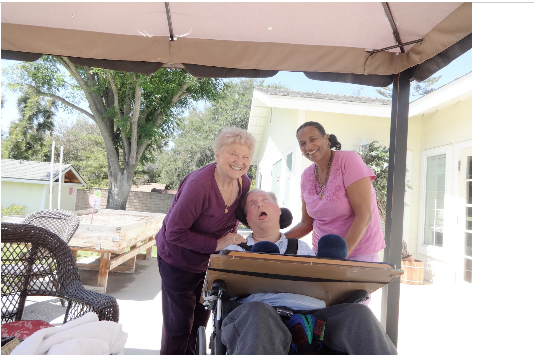 Years ago when I first met Berniece at a Sai Spiritual Education Teacher's training workshop, I promised her that if I ever made it to California I would give her son a foot reflexology treatment. Last year, Sai Baba came to me in a dream and told me to continue doing reflexology because it helped a lot of people. Now it was time to make good on my promise. Parking our car near the bookstore. We had lunch with Berniece. She took us to a wonderful restaurant where we enjoyed a sumptuous vegetarian meal and then shared a really huge decadent chocolate sundae cake. We were like three playful children laughing, giggling stuffing our faces with this devilishly, divine treat. Berniece gave us all delicious lingam water from this heavenly stone. We all kissed Jay goodbye and left him in Swami's care. Berniece took us to her house, a lovely home surrounded by gorgeous peony and tasty avocado trees. We met her husband Ron who is on oxygen support with COPD. Berniece has to also tend to him continuously. She has been through so much in her life and is still so positive and uplifting. I was very happy to give her a foot reflexology treatment too. Berniece shared that once she went to India by herself. It was right before school started she had a three week window before she had to be back for the beginning of the school semester. Sathya Sai Baba had appeared in a dream and told her to come to India by herself. So, Berniece packed up and went off to India. She was fine for a while and then one night she started experiencing terrible doubts. She started wondering if Baba was really who He said he was...God. Maybe He was really the Anti Christ. Even though she thought she had faith in Baba at this particular time all these dreadful doubts surfaced. Bernice was in agony and confused, she wondered what she was doing there. She felt how ridiculous it was for her to have come to India because of a dream. She felt very unsure of herself. Still the next day she went to darshan. Berniece made up her mind not to look into Swami's eyes. She said to herself, He is too powerful, she lowered her eyes trying not to look at Baba. But then she heard laughing next to her. It was just like she had heard in her dream. She looked up and saw Baba coming towards her. He told her go into the interview room. Swami then did something so amazing. He asked Berniece if she would like some candy. This was exactly what her father used to do when she was upset. Baba materialized a delicious candy that was still warm. He looked deeply into her eyes and said “Jesus, Sai Baba all the same”. Our visit with Berniece was drawing to a close. We wanted to avoid the southern California rush hour madness. We bid adieu to our gracious hosts and returned to our hotel, continuing the rest of our California pilgrimage.